Question 1: In the above photo there is no line defining GUR but it is marked with a sign. May a right-handed player take relief, without penalty, for a) ball A, and b) ball B? Answer: The player may take relief without penalty for both balls. Ball A lies in an obvious area of GUR. Ball B lies in an area where a right-handed player would have to stand in the area of GUR to play his stroke (Rule 25-1a). 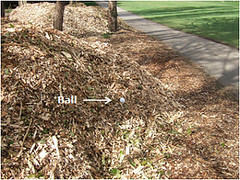 Question 2: Following course maintenance a player's ball lies in a pile of wood chippings. May a right-handed player take relief, without penalty? Answer: Yes, the wood chippings are obviously piled for removal. The definition of GUR states; "ground under repair includes material piled for removal ... even if not so marked." Question 3: If a player's ball is definitely known to have landed in the wood chippings piled through the green, but cannot then be found, what is the ruling? Answer: The player may take relief without penalty under Rule 25-1. 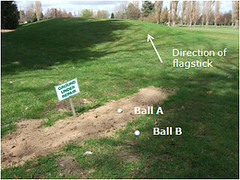 The player must determine the spot where the ball last crossed the outermost limits of the abnormal ground condition and drop a ball, without penalty, within one club-length of and not nearer the hole than the nearest point of relief not in a hazard or on a putting green. Another 'Rhodes Rules School' Q&A will follow next week.